The intention of this chapter is to show the peculiarities of the point of view of Dressler and de Beaugrande, expressed in their work. The position taken by the two authors in their Introduction is a veiled criticism against van Dijk and Petőfi, which are accused of excessive rigour. Dressler and de Beaugrande’s procedural approach avoids the use of logical bases and they propose a point of view closer to cognitive science. According to Dressler and de Beaugrande, the heart of the procedural approach is semantics. In their view, knowledge and meaning are sensitive to the situation in which they are used. So, the two authors believe that framing the texts and the knowledge about the real world and the situation, in which the communication occurs, within a logical system is probably absurd. 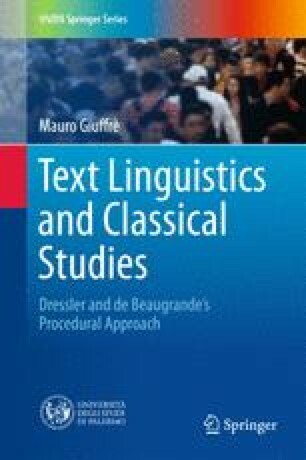 So, the procedural approach does not require semantic markers to be set in order to constitute the logical apparatus of a textual theory; rather, it indicates the need to engage in the search for types of global cognitive models on the basis of which textual production and reception functions. A well-formed text has to satisfy seven fixed criteria: cohesion, coherence, intentionality and acceptability, informativity, situationality and intertextuality. There is no such thing as the “philosophy” of language. There is only linguistics; and grammar is an essential part thereof.